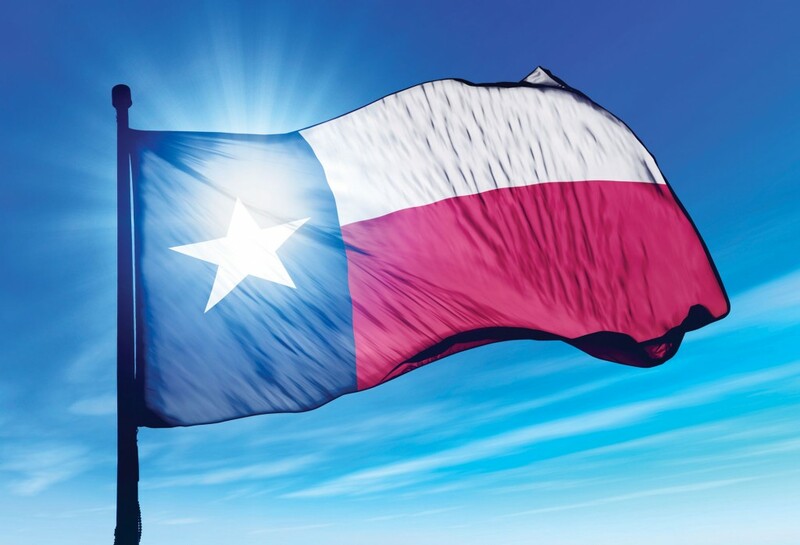 A few people have asked me for some more information on how I made the fatties at the Plano Outlaw Eggfest, so that’s what I am going to attempt to do here. 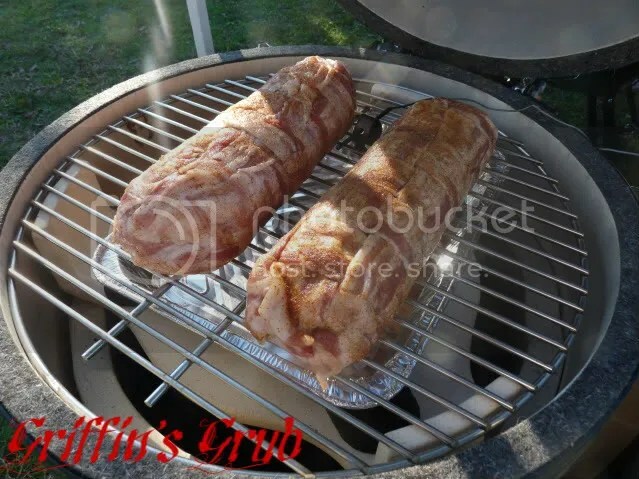 I am not taking credit for inventing this, I’m not sure who did, but it has been floating around the BBQ Forums and BBQ circuits for a while now. So what is a fattie? 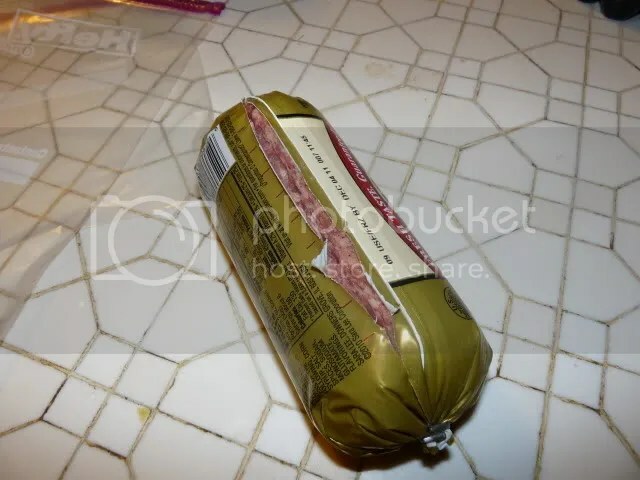 Basically, it is a roll of breakfast sausage that has been rolled out flat, filled with ingredients, rolled back up into a cylinder and may or may not be wrapped in bacon. Personally, I like to wrap mine in bacon, cuz you know the saying…. Start out with some breakfast sausage. I like Jimmy Dean, but that’s just preference. You can either go mild or hot, up to you, but this time I went with mild. 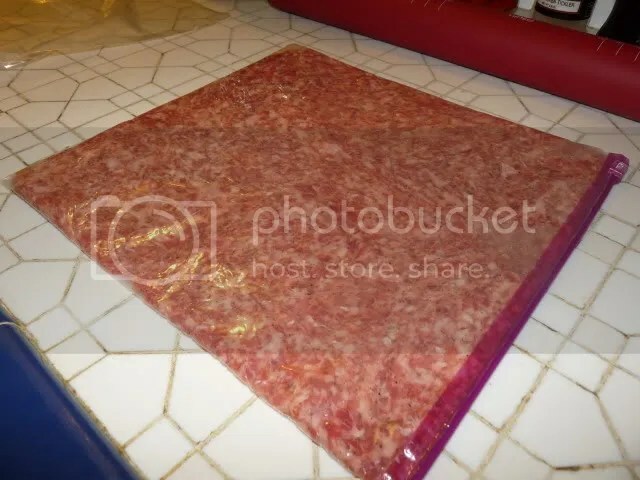 I have found that the best way to roll out the sausage so that you get a nice even rectangle and not make a mess is to place it into a one gallon zip-lock bag. Try to get as much of the air out as you can while sealing it shut. Then, take a rolling-pin, or whatever you have handy, and flatten it out. It should fill up the bag. Try and get it as even as possible. 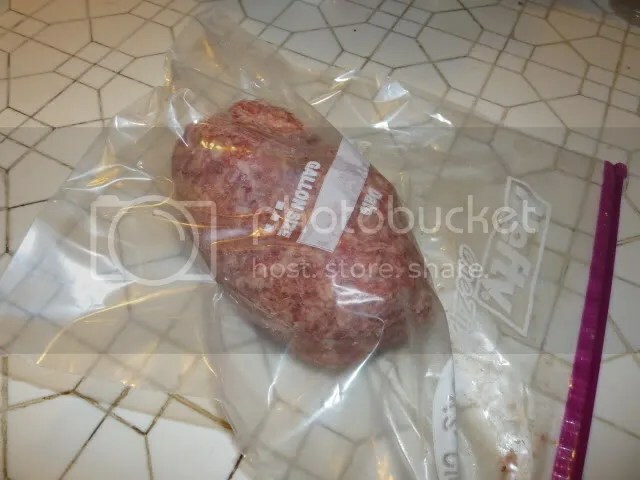 Next, take some scissors or a sharp knife and cut along three sides of the bag so that you can open it up and begin filling with your chosen ingredients. When making a fattie, your imagination is the limits. You have tons of cheeses you can choose from, add more meats, veggies or not. It’s all up to you and what you like. I’ve seen people make a breakfast version with scrambled eggs and cheese inside. I’ve seen a pizza version with pepperoni, mozzarella and marinara sauce. I have even seen one stuffed with hotdogs, chilli and cheese. So just find some ingredients you like to stuff it with. Here, I decided to mix some cream cheese along with some extra sharp cheddar. I blended it up and applied it in an even layer to the fattie. 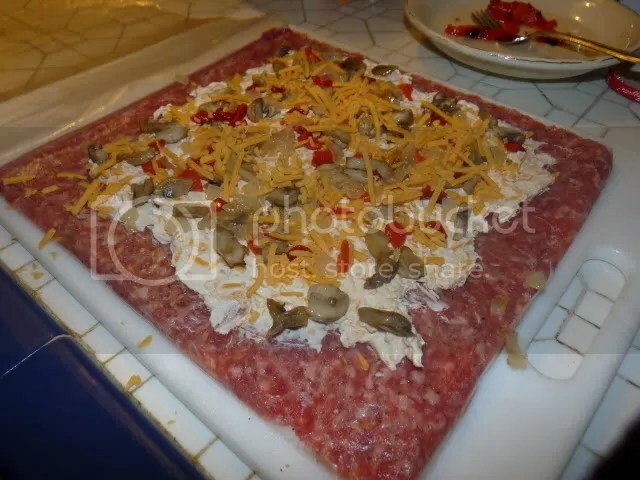 After spreading the cheese out, making sure to leave a good sized border so it could be rolled up later, I added my toppings. For this fattie, I went with some caramelized onions, sautéed mushrooms and some roasted red peppers. Take an edge of the zip lock bag and roll it up like a huge roll of sushi. Then I took a butter knife and used it to make sure that the ends and the seam were sealed up so that none of my cheese would leak out. At this point, you need to decide if you are going to wrap it in bacon. Of course I was going to. 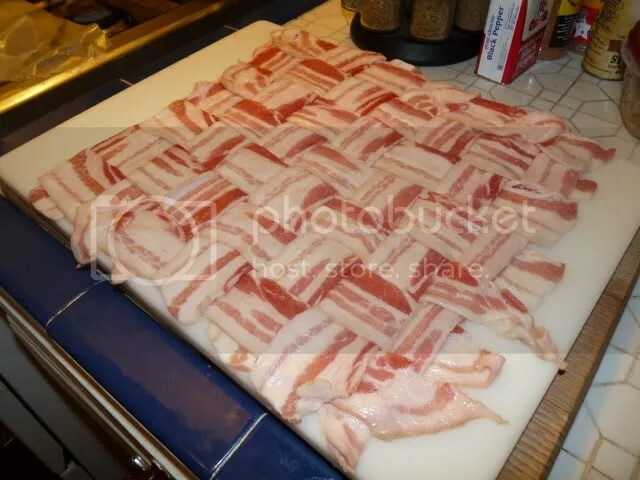 I took a whole package of bacon and made a bacon weave. I’m not going to go into details on that here, but you can go to youtube and find a video on how to do it better than I can describe. 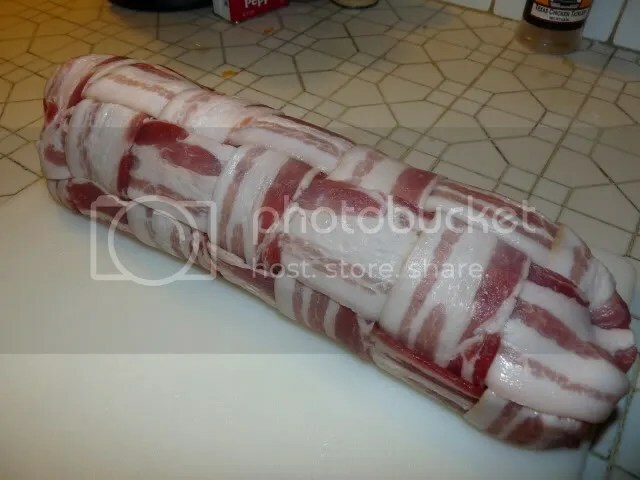 I took the fattie and placed it on one edge of the bacon weave and then rolled it up in the porky goodness sushi style again. The final step before going to the grill is to apply your favorite bbq rub. I’d tell you the one I used, but I honestly can’t remember now. It’s been a week. To cook, set up your BGE to 350 with the placesetter in as you want to cook this indirect. I can’t tell you how long it took to cook these two fatties. I think it was about 2 hours. You want to make sure that your sausage is cooked to about 165 and that your bacon is nice and crispy. 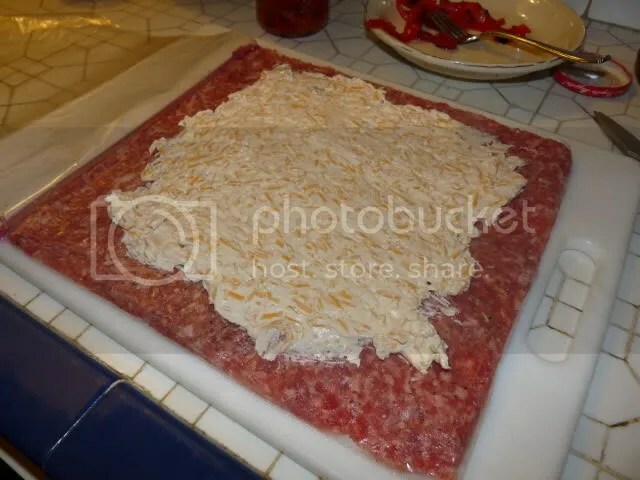 Do not slice up immediately as all the cheese will leak out and leave you with a huge mess. To serve these up, we sliced them and served on King’s Hawaiian Rolls, but they can be eaten alone or with your favorite rolls or biscuits. Hope that helps you create your own fattie. Thanks for looking, now go and fire up your grill or smoker this weekend and cook somethin’ up. I have saved this one, I am not in the BBQ circuit so I was unfamiliar with this. Love the method of preparation as well as the flavors in this. Thanks for posting this one-I am ready to get my grilling! Give it a shot, Tina, and let me know how it turns out. Looks great Griffin. I love the gallon bag idea. I never used that method. Can’t wait to try. Thanks, Joe. Can’t ‘member where I picked up the gallon bag idea, but it sure makes it easier. That fattie is awesome! 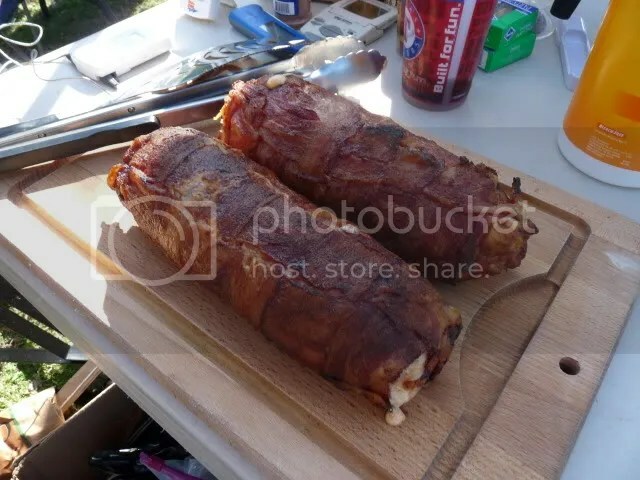 That bacon wrap looks really delicious! Excellent! I might be having a lot of family at my house for Christmas this year. I think I’m going to make one of these up and serve them with some biscuits for breakfast. Looks like it will feed a lot of people. Loved making the Fattie almost as much as making it, Jason. Turned out great and has now been added to the “must have” list for our Christmas family breakfast. Glad you enjoyed it, Chris. What did you stuff it with? Much like yours…cream cheese, sharp cheddar, provolone, mozzarella, caramelized onions and some crushed red pepper. Made 2 for Christmas breakfast and they were a huge hit. Was going to post pics on the BGE forum and give you credit of course. Looks awesome! And like you I need to limit how often I eat these. The stuffing looks great! Was this on a newly purchased Egg? It’s still white! Love this recipe. I will be trying this soon. That was at an Eggfest. I got to fire it up and cook on it for a day and then somebody who pre-purchased it took it home.